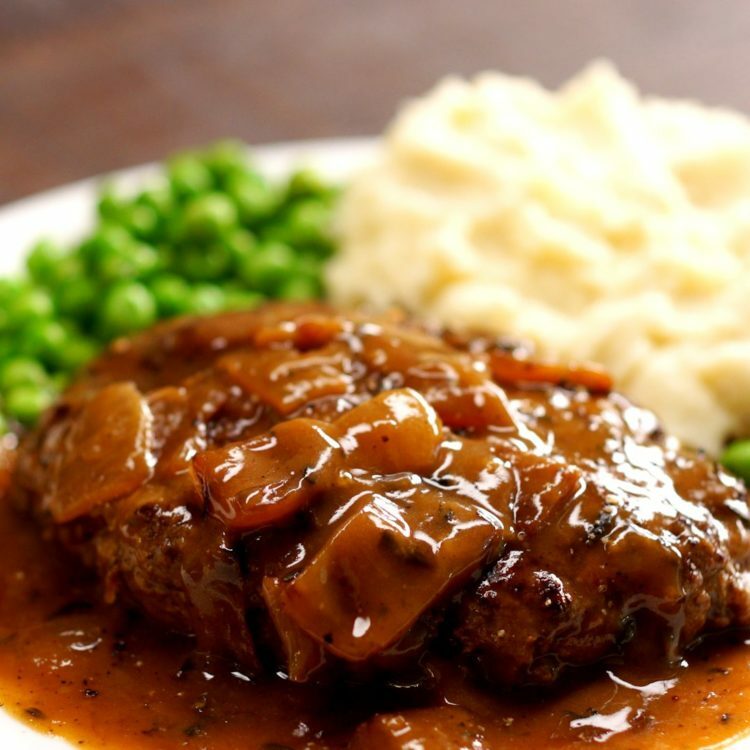 When was the last time you had a good Salisbury steak? It is perhaps one of the meals that are most familiar to us because they serve it in school, make it as a TV dinner and sometimes, we make it for our family from scratch. There is a reason why it is such a popular dish and is used so widely; it’s delicious! 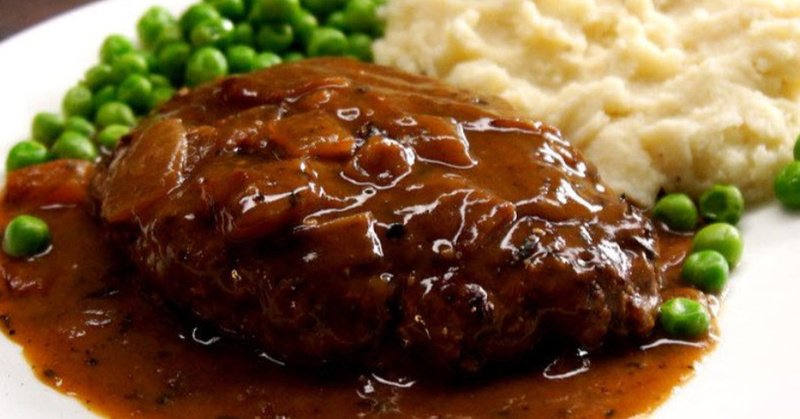 If you have been hankering for a Salisbury steak, you are in for a real treat. This recipe makes it so delicious that you may just want to lick the plate after you are done. 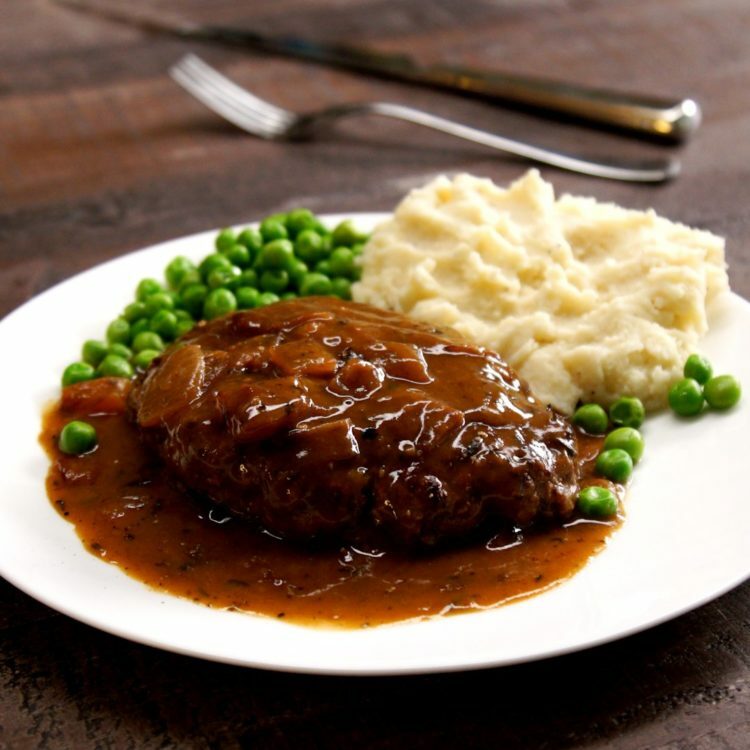 There is much that goes into making a good Salisbury steak, although this recipe makes it very easy. At the cornerstone of the recipe, however, is a great gravy. 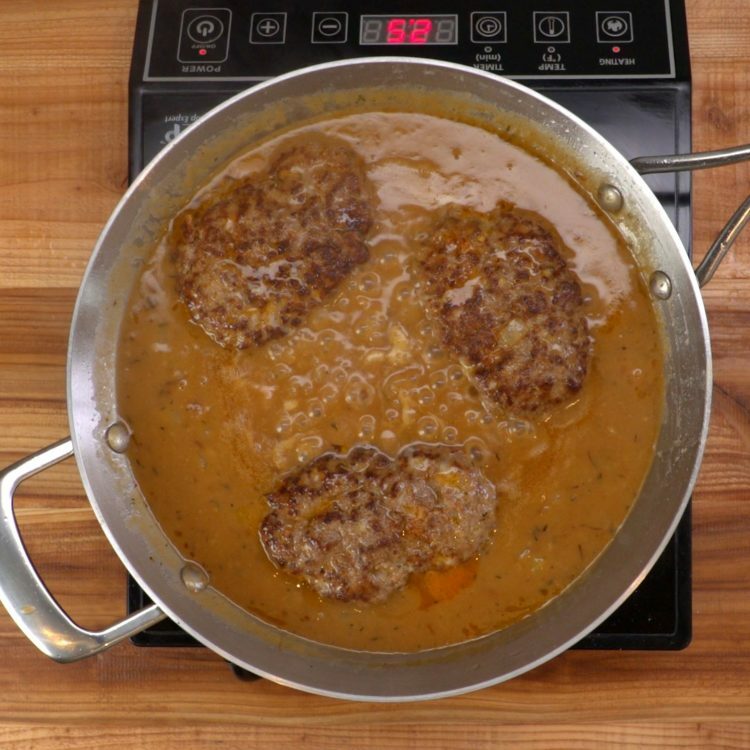 When you make this delicious gravy recipe, all of the flavors from the steak are going to simmer into it. You can read down through the recipe and see how simple it really is. You can then have dinner ready tonight within a matter of minutes. 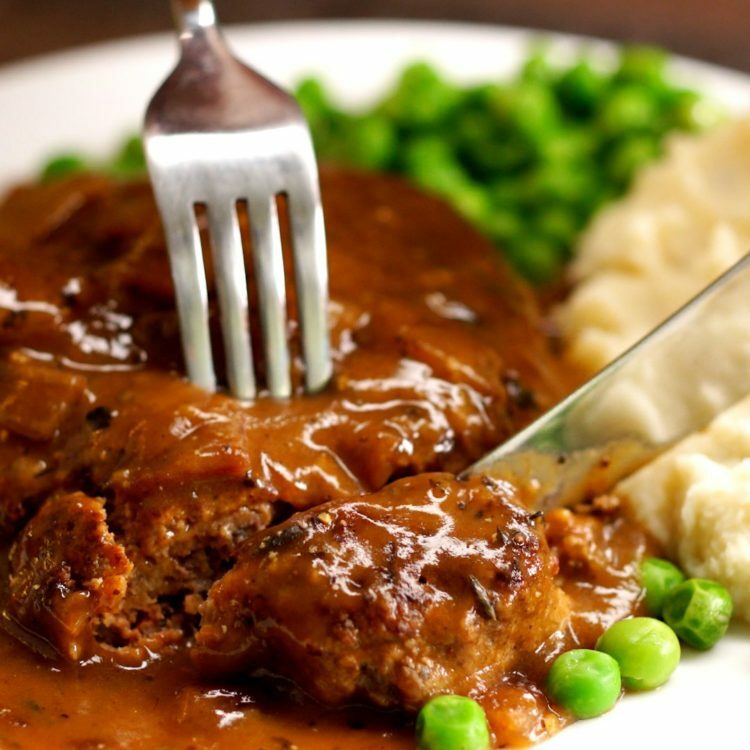 Of course, you could always grab a TV dinner Salisbury steak from the frozen food aisle at your grocery store. Once you compare it with this traditional recipe, you will find that it is more than a quick meal, it is one to put into your weekly rotation. Prepare the gravy: add the chopped onions to the skillet and reduce the heat to medium-low. Cook the onions until they are translucent and caramelized, about 15 to 20 minutes. Sprinkle 2 to 3 tablespoons of flour over the caramelized onions and stir to coat. (Use 2 tablespoons of flour if you like your gravy on the thinner side, or 3 tablespoons of flour for a thicker gravy). Cook the flour-coated onions for another minute, until the flour starts to smell toasty. Add the dried thyme and cook until fragrant, about 30 seconds. Gradually stir in the beef broth and soy sauce and raise the heat back to medium. This recipe starts out simply. Ground beef along with Worcestershire sauce, breadcrumbs and panfried as oval patties. Afterward, it is smothered in a delicious, onion gravy. The real secret is waiting for the onions to caramelize properly and it is worth the extra few minutes to do so. It adds a layer of flavor that makes this an awesome meal. Most of us are familiar with Salsberry steak but did you know it was named after an American Civil War physician who came up with a recipe in 1888? Dr. JH Salsberry thought that this dish should be eaten for breakfast, lunch and dinner. He was a supporter of the low-carb diet and if you like to eat low-carb, you may want to consider this one in the rotation. If you want to take it to the next level, why not add some creamy mashed potatoes and buttered green peas? Of course, you can always heap on some extra gravy. Enjoy dinner tonight!